January 4, 2013 January 4, 2013 - by benign0 - 54 Comments. The clock is ticking for suspended Cebu Governor Gwendolyn Garcia who is currently besieged in the provincial capitol after she defied a suspension order issued by MalacaÃ±ang mid-December last year. As police mulled over their options short of physically dragging Garcia out of the public building, Acting Governor Agnes Almendras Magpale is considering cutting off power and water to the building — not a good prospect to face in a stinking-hot country like the Philippines where the well-heeled depend on airconditioning and frequent showering to keep the their scalps and skin lice- and libag-free. When the fully armed, fully masked SAF pushed the door open aiming their high-powered firearms at us, they were greeted by TV cameras as we shouted “Media kami.” They went to another room but finding it empty came back. They wanted to bring us out but we complained about stinging tear gas. One SAF member said, “Okay na, okay na.” One of us said, “Why donâ€™t you remove your mask. Letâ€™s see if you can say, â€˜okâ€™. ANCâ€™s Ces Drilon went on air to appeal to the authorities to stop the tear gassing so we could all go down. I doubt if we will ever hear those words again uttered with the same pompousness as they were back in 2006. Such quaint and empty rhetoric in hindsight. Times have changed indeed. What were once state armed forces labelled the bad guys by these “media people” are now under the command of a government their employers are in bed with. When you step back and regard the bigger picture over a broader historical context, you begin to see the folly in putting one’s faith in mainstream Philippine Media and the “heroes” they prop up before us. Garcia, unfortunately, is imprisoned by thinking that is a tired relic of the mid-2000s’ ocho-ocho activism. One just needs to recall the fatal role these same “media people” played in the degeneration of that infamous hostage situation that led to the deaths of nine Hong Kong tourists that blighted the beginning of the Second Aquino Administration. 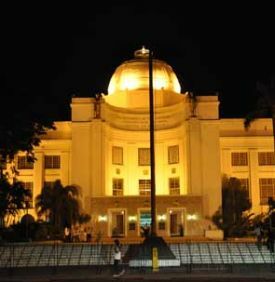 Cebu once regarded itself as a proud province able to stand on its own feet. Unfortunately, Garcia is demonstrating that her constituents are no more than the same third-rate trying-hard copycats that the rest of their compatriots are. Next Article Travelers out of NAIA in 25 minutes? DOT misses the point in less! As if most of the imporished Filipinos around the country aren’t living like cavepeople already… and acting like so! But meh, is there a politician who even listens to us? This atrocious and deplorable habit of politicos to use gullible, ordinary citizens to cover for their hide is akin to Saddam Hussein using children and babies as “human shields” just so he could protect his selfish interests and hang on to power. Gov. Gwen Garcia can fend for herself, she has got the means to fight her battles. Why the need to put poor Cebuanos in harm’s way? That to me is malicious, irresponsible and egomaniacal. Pnoy is dictatorial, no doubt. But there are other avenues to fight this dictator. In blogsites, on your walls, this coming elections, in places where no blood needs to be shed. â€œWhat is it about power that makes humans cling to it for as long as they can no matter how wasted or ugly they become?â€ — Power means control over other people, as we all know, man. Speaking of becoming wasted and ugly, and assuming power makes faces turn wasted and ugly; could it be the case that Gwendolyn has had invested so hard on her looks to keep her from getting ugly, meanwhile Agnes has failed to address her looks? Allegedly, of course. Seriously, Agnes is damn ugly. Living in a cave is certainly a lot better than sleeping in a prison cell — which is where Gwen Garcia may find herself confined in very soon. â€œThe Sandigabayan has issued three hold departure orders against Cebu Gov. Gwendolyn Garcia. So, thatâ€™s FIVE in all. Whoa! Are we now on the side of “the great leader” BS Aquino? The creeping dictatorship is getting bolder in Cebu. A lot of yellow propagandists are hitting her on the internet Cebu Sun Star shout box. I would prefer to take a gallant view of the lady governor. She is being hit by all the yellow resources that BS can dish out. We must remember that the executive power of BS is not absolute. He implements the law. This is true. But he cannot interpret the law. Let us wait for the decision of the Court of Appeals. Looks like BS Aquino has a penchant for going after beautiful women who are also his perceived enemies. She is still presumed innocent until otherwise proven by the courts. This case may even reach the Supreme Court. I forgot to ask… Does BS Aquino selectively hate beautiful women whom he perceives as political enemies? Maybe BS Aquino is insecure of their beauty considering that he’s G-A-Y. That’s more like it, Johnny Derp. Yup. I don’t understand why BenignO is now singing the tunes of the yellow propagandists like Tordesillas. Gwen Garcia has a solid mandate to finish her term. She is holding an elective post and until she is proven guilty, she cannot be unseated by some trumped up charges by the delusional executive in Malacanang. This is clear power grab, plain and simple by the Liberal Party. They are getting bolder with their defiance of the rule of law. What Garcia and her supporters should do is to be firm and steadfast. We all know the media are in the pockets of the yellow oligarchs, Osmena no less is one disgusting lackey of the yellow oligarchy. I don’t doubt for a moment that Garcia was elected to her post and has the mandate of the people of Cebu. But if you look at the issue here in its purest form, the politics surrounding it is beside the point. The real question here is simple: On what authority does Garcia deem the suspension order handed out to her illegal? As I said in a previous article, perhaps the suspension order was flawed. But that is for a judge to decide. By holing herself up in the Cebu Capitol she has de facto acted as a judge presiding over her own case. That is wrong on two counts: (1) She is not a judge, and (2) even if she were a judge, judges do not rule on cases in which he/she is a defendant. You cannot resist arrest, say, when you are stopped for speeding by a cop on the basis of your opinion that the officer’s radar gun is mis-calibrated. You resist arrest at that instant and you simply get yourself into deeper trouble and possibly give the arresting officer ample justification to use force to apprehend you. While the politics, intentions, agendas, and motivations surrounding the way all the parties involved in this brouhaha may be debatable, the fact of the illegality of Garcia’s behaviour is NOT. And because that is the only thing here that is not ambiguous nor debatable, then she is pretty much screwed. The dirty politics of BS Aquino is the crux of the issue. It is the cause and effect. The main problem. The defenses of Governor Gwen Garcia have been stated in her petition filed with the Court of Appeals. It is clear that the national government is at fault for what it did or failed to do. BS Aquino is at fault. He committed certain lapses in rules, abuse of discretion and/or power. The rule of law and even constitutional provisions have been ignored if not violated by BS Aquino on many occasions. Governor Garcia has been erroneously compared to have acted as a de facto judge by the author. The comparison is illogical. How can this be? She is different from BS Aquino who in the past has already judged as guilty before trial his perceived enemies. My point is, from the very onset she was defying a judgement from the head of the executive branch who is not even empowered to interpret the law. His mouthpieces have their own interpretation of the rule of law that serves their dark political motives and intentions. I will not bother to compare what happened to VP Binay and how he reacted. The alleged illegality of Garcia’s behavior is your own biased opinion. The case is already within the jurisdiction of the CA. The author cannot afford to pass judgement on Gov. Garcia. You are also not a judge or a traffic police officer.The Sub judice rule applies. This is what I believe in. Tyranny should be defied in a peaceful manner whenever it rears its ugly head. i totally agree, thomas jefferson. this power by the executive to suspend an elected official, for alleged offense he/she may have committed, is unconstitutional. one is being penalized without the benefit of a trial. it’s like you’re guilty until proven innocent….and suspending gov. garcia for 6 months when the election is just 5 months away – and replacing her with a staunch LP ally and the wife of the Cabinet Secretary, no less, just leaves a very bad taste in the mouth! i hope gov. garcia hold steadfast in her resolve not to give in. @ThomasJefferson, the dirty politics of BS Aquino is of course an issue. But it is one issue that surrounds the specific issue I tackle in the article — which is Garcia’s defiance of a Malacanang order that flawed in its execution as it may be was executed nonetheless. The flaw in the manner with which it was executed is an opinion at this point until a judge rules on its legality. Garcia is not a judge. And therefore her opinion on its legality does not hold any legitimacy as is her action on the basis of that opinion. Defiance and protestation are two different things. I agree that one can protest peacefully. But the concept of defying peacefully in this case merely erodes the credibility of Garcia’s “cause”, simply gets her into deeper trouble, and gives ample justification for the police to apply the necessary force to apprehend her. Remember that my original beef with the Yellowists is their addiction to ocho-ocho (street “revolution”) activism. Whoever gets into that sort of thing falls within my radar of idiocy. but we still should not let bs and his minions get away with it. Indeed, we shouldn’t but that is another “fight” that is on-going and will continue regardless of the fate of this Garcia lady. Of what value is Garcia in the bigger scheme of things? Will she be missed if she is gone? Highly unlikely. She’s just another REPLACEABLE politician. Aquino wants to put his own man or woman, in this office. This is a Corona style of removing people in office, done by Aquino. It is a dangerous move. Aquino is becoming a dictator now. You vote for leaders. Aquino can remove the leader, you voted; to put his own man or woman. He is worse than Marcos. Hang on – some of us remember Marcos. Your level of moronism is now similar to vincensus ignoramus woman. Did you even read the article? Did benign0 even said that he supports Gwen Garcia? O pinapakita mo na naman yung pagiging juan tamad mo’t atake lang ang kayang mong gawin sa amin? Mods I recommend to ban this irrelevant troll. yes i read it and i didnt claim that benigno supports gwen. im saying that since in this issue gwen and pnoy are on opposite sides the grp fanboys will naturally side with her no matter what she does. ok? i sense a generalization here. Cards on the table sendonggirl . You are a fanboy/ fan girl of who or what? To say “the truth” would be an outright lie. Benigno does have a point about Guv Gwen’s dilemma. BSA (unfortunately) has a very powerful weapon that is legal and can be used against the Guv and she is powerless against it. What is questionable is that BSA is using the legality of the law to defeat the justice of the law. The Guv has the righteousness of her cause, but it does not grant victory. The only thing she can do is let BSA have his political victory, but of course it goes without saying that BSA lost the moral and ethical aspects of this fight….. The bottom line is the Court of Appeals already acquired jurisdiction over the case. Any judgement calls from the author or the yellow trolls are not valid, legal or acceptable as gospel truth. At most, these are just biased opinions. Let us respect the CA and wait for its interpretation of the law on the matter. Please… no more opinions on the facts, content or substance of the case which is already with the CA. @ThomasJefferson: The only person here not respecting the Law is Gwen Garcia. If she truly respects the law, then she should surrender to the cops and let the process run its course — a process which you yourself insist should be “respected”. Your appeal for a moratorium on opinion, is inconsistent with your defense of Garcia’s action which itself is based on her OPINION “on the facts, content or substance of the case”. Oh I see… and when did BS Aquino or his followers ever respect the law? They even conveniently interpret the law in their favor to push their dark agenda. They are resorting to black propaganda to destroy the image of Gwen Garcia, The entire machinery of state was thrown against her. You do remember CJ Corona? Why should she surrender to the cops when she is not guilty of any criminal act? I do not need to explain the Sub judice rule. I am throwing down the gauntlet. Are you now the defender of the dictator? Like First Officer Spock let me say, your logic is fascinating. Obviously you are an alien life form of lesser intellect. Beam her down scotty! actually, the issue here is the LP’s overall plan to have cebu on LP’s palm when the presidential election comes in 2016. by suspending garcia for 6 months when the election is just 5 months away, it strengthens their bet, now acting governor and LP bet Magpale to win in this may’s gubernatorial elections. and by winning the governor’s seat, the LP presidential bet Mar Roxas will be in a better position to take Cebu, which have the biggest voter registration in the whole country. it’s all about politics and outright grab for power…this morons(Roxas and Abnoy) is so effin’ obvious! it is not just who is right or wrong. maybe due process! can resolve that. it is about p-noy selectively targetting opponents whilst his kkk cronies and supporters all have their hands in the cookie jar. who is next – gov. pineda i imagine. It looks to me (and I know nothing of the rights and wrongs of this case, other than what I have read, here and elsewhere) that time is not on Garcia’s side, here – she has tried to whip up some sort of a “people power” action, but the Palace is not stupid enough to grant her wish by sending in police, let alone troops. The longer she spends as the Philippines’ richest squatter, the weaker her position becomes. You know nothing… period. Yet you defend the propaganda line of the dictator. You are obviously a black propagandist when you stated: “The longer she spends as the Philippines’ richest squatter, the weaker her position becomes.” Philippines richest squatter? Repeat the big lie and it will appear as the truth. She is not the richest. But your statement is rich in calumny. Take an IQ MENSA test and see if you will make the grade. You are still an alien life form of lesser intellect. Whilst we are, of course, glad to see you alive and well, after all these years, do tell us – why should we respect the views of a man who mortgaged his own children? And in the event that you are not, in fact, the real Thomas Jefferson, do try to keep in mind that silly abuse is not the best way to make friends and influence people – influencing people being what this is all about, right? ‘Indeed, we shouldnâ€™t but that is another â€œfightâ€ that is on-going and will continue regardless of the fate of this Garcia lady. Of what value is Garcia in the bigger scheme of things? Will she be missed if she is gone? Highly unlikely. I agree with what you said. Truth is, Gwen Garcia was a bit of a disappointment to me after she appeared to have switched sides even as my eyes were still moist from her ‘Palabra de honor’ speech during the 2010 campaign. I guess being ‘cooperative’ was an attempt to protect herself from the wrath of dear leader bs, but of course, we all know what happened. I was actually following the events that unfolded with neither glee nor contempt but with the amusement I get from watching wwe smack downs. I have no love for politicians….and if this is what it would take for the people of Cebu to see the true nature of bs, whom they voted, and the rest of his ilk, then so be it. Maybe then they will remember why the South had always stood up against Imperial Manila. However, as a duly elected official, it is important for her to show HER people that she is no pushover. Heck, she really should as this is the only way to stop a bully, and it is her prerogative how she wants to go about it. Will she succeed? Who knows. Given bs’ obsessive nature, the guv’ner’s on an uphill battle. I am comforted with the fact that at least, this incident is making him smoke a few more sticks a day, and he would likely corrupt another official in the judiciary. So much for his tuwad, er, tuwad na daan. Again, to do nothing in the face of injustice would be like handing over our country to another dictatorship on a silver platter. Believe me though when I say to you that I hear you bro on that ‘people power’ thing. no need to cut off water and electricity. stop her supply of botox and she will soon leave, or if not she will look like the vice-governor. @Libertas you’re right its the BOTOX treatment that she needed that is the reason why gwen sneaked out of the Capitol in the middle of the night hiding her face.